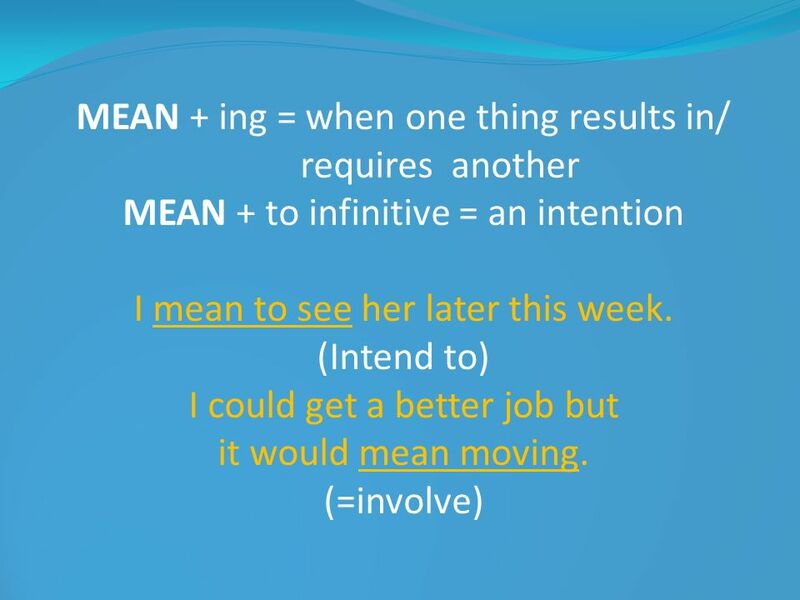 Infinitive or –ing ? Choose the right form !. 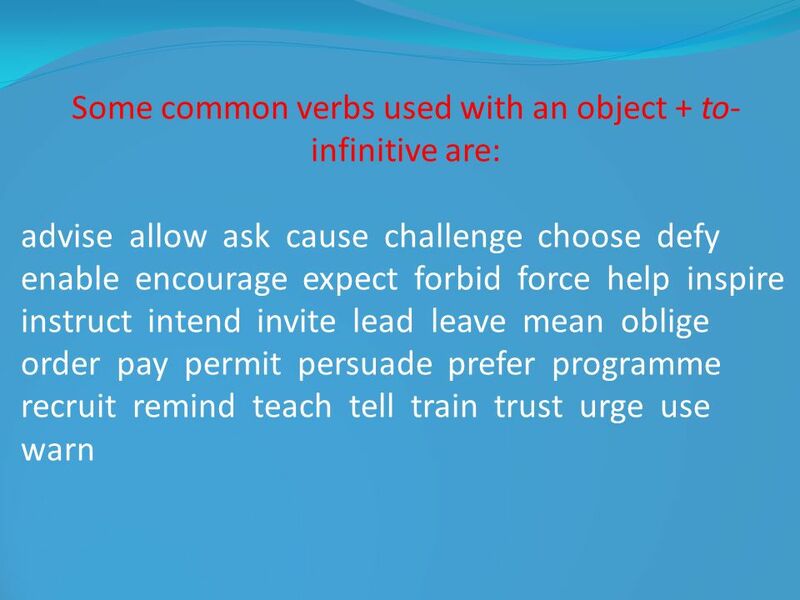 1 Infinitive or –ing ? Choose the right form ! 1. 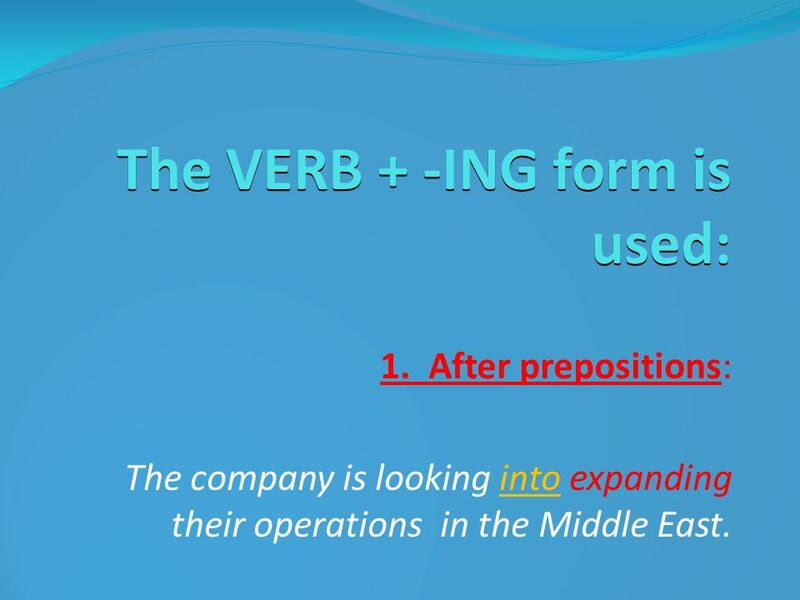 After prepositions: The company is looking into expanding their operations in the Middle East. 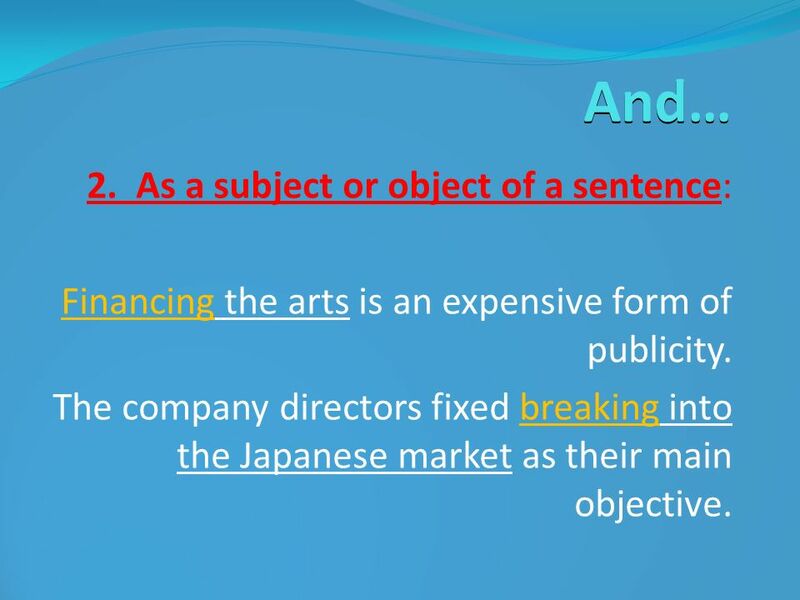 Financing the arts is an expensive form of publicity. The company directors fixed breaking into the Japanese market as their main objective. 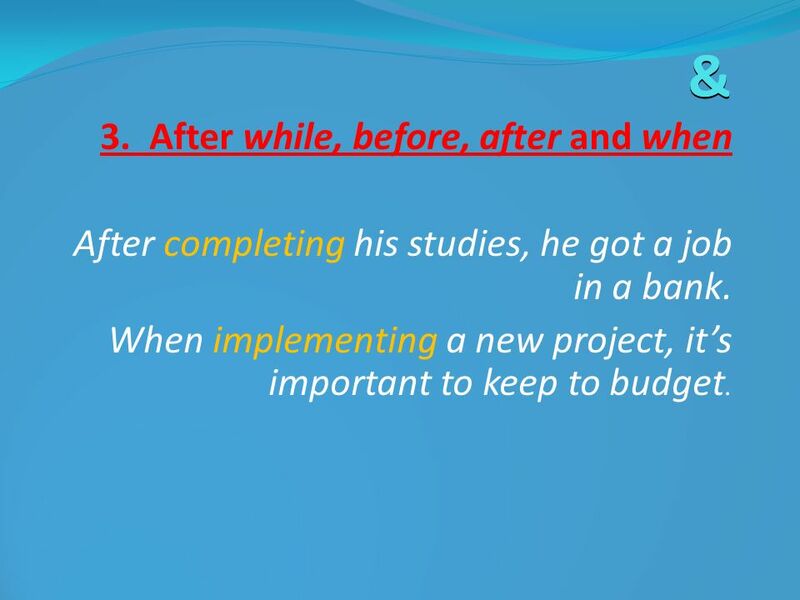 After completing his studies, he got a job in a bank. When implementing a new project, it’s important to keep to budget. 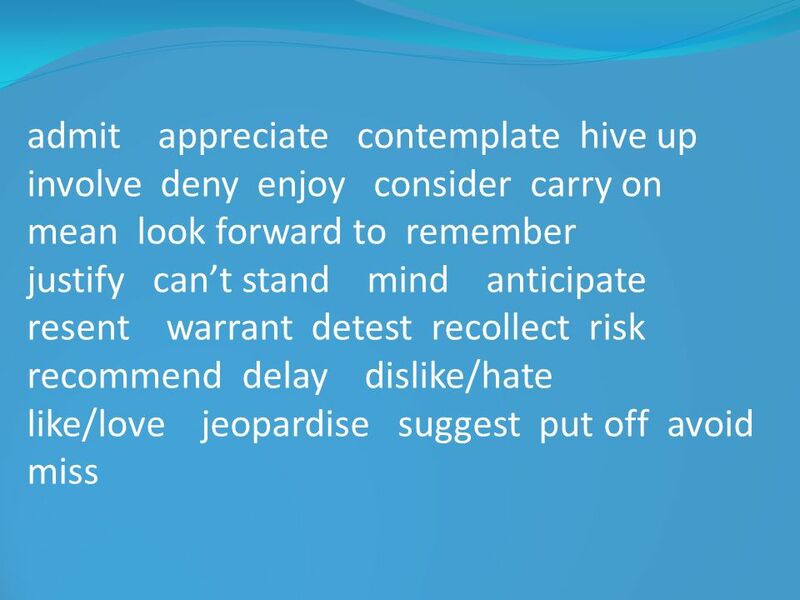 Admit, appreciate, avoid, celebrate, consider, contemplate, delay, deny, dislike, enjoy, face, fancy, finish, imagine, involve, keep, mention, mind, miss, postpone, practise, report, resent, resist, risk, suggest Ex. : They postponed launching their special offer until after the holiday season. 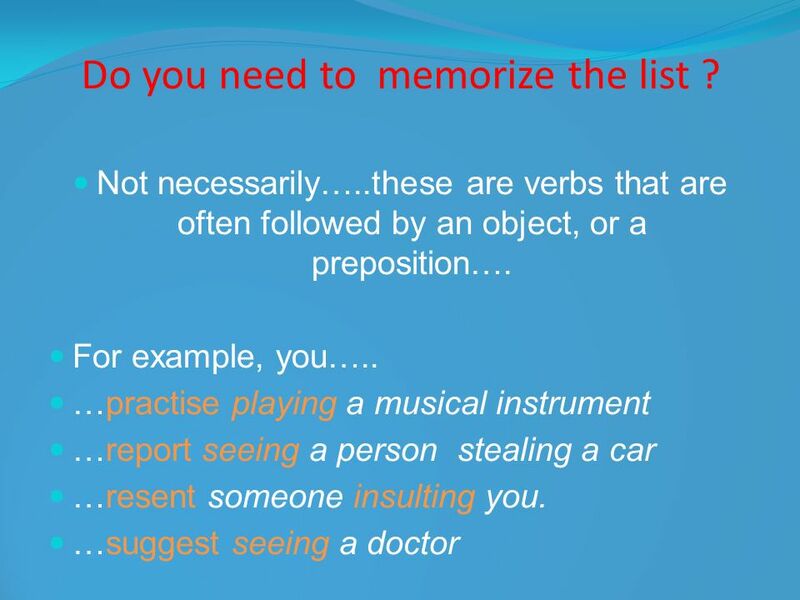 7 Do you need to memorize the list ? 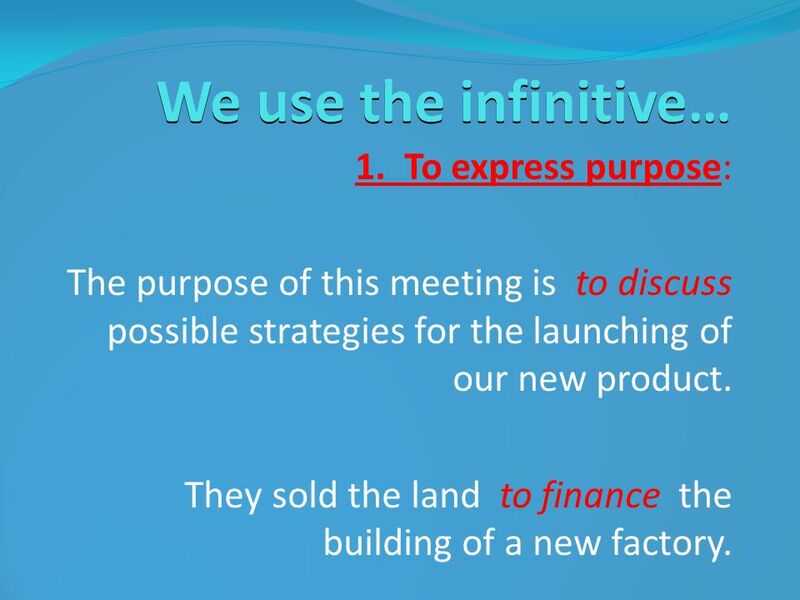 The purpose of this meeting is to discuss possible strategies for the launching of our new product. They sold the land to finance the building of a new factory. 9 It’s too far in the future to decide yet. & 2. 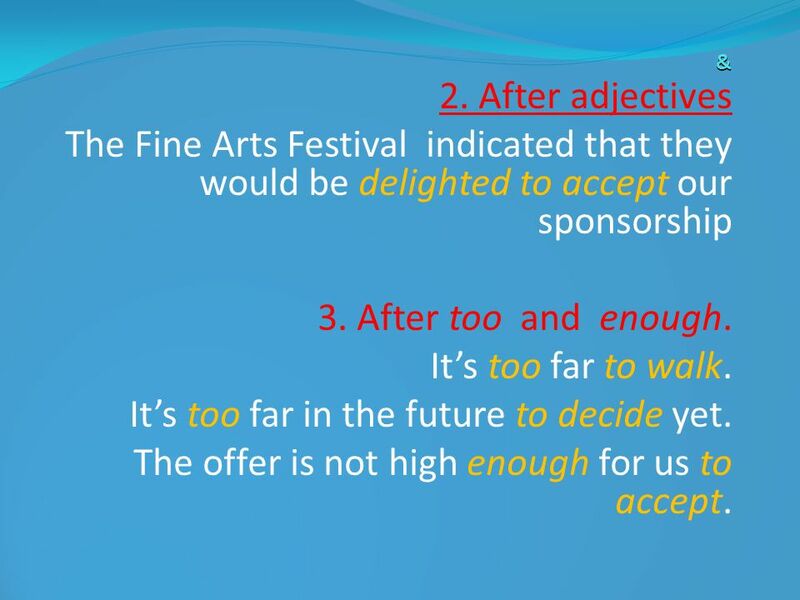 After adjectives The Fine Arts Festival indicated that they would be delighted to accept our sponsorship 3. After too and enough. It’s too far to walk. It’s too far in the future to decide yet. The offer is not high enough for us to accept. 10 & 4. As a formal way to talk about something that will happen in the future : President Obama is to visit Italy next April. Volkswagen are to open a new factory in Romania next month. 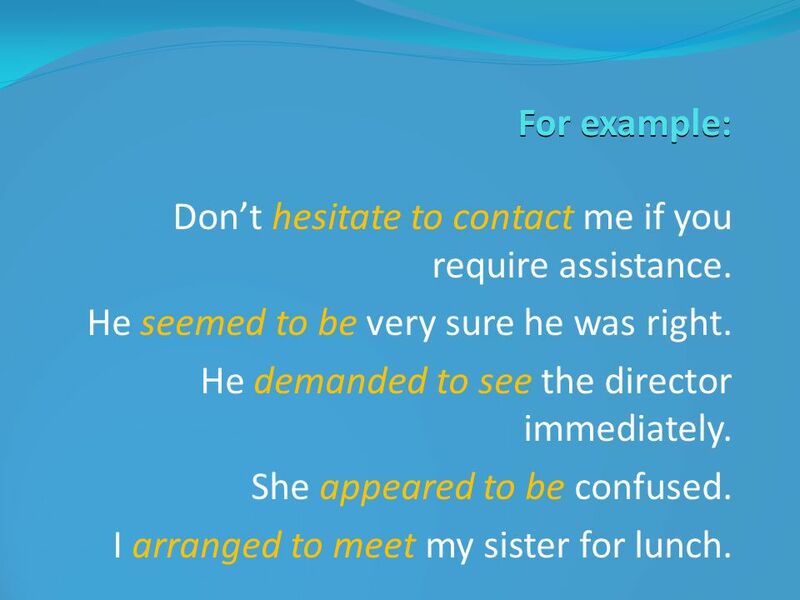 12 For example: Don’t hesitate to contact me if you require assistance. He seemed to be very sure he was right. He demanded to see the director immediately. She appeared to be confused. I arranged to meet my sister for lunch. 13 1. 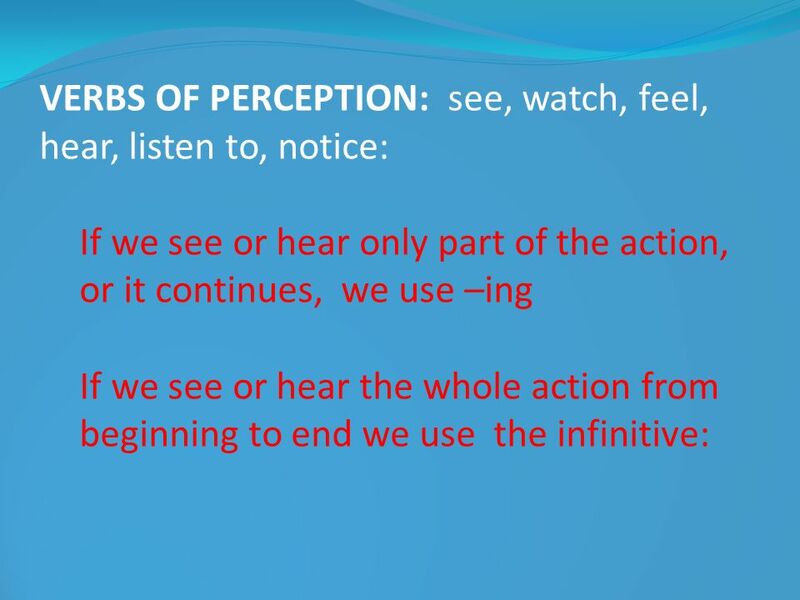 ……(GO) into business involves …. (TAKE) a certain amount of risk. 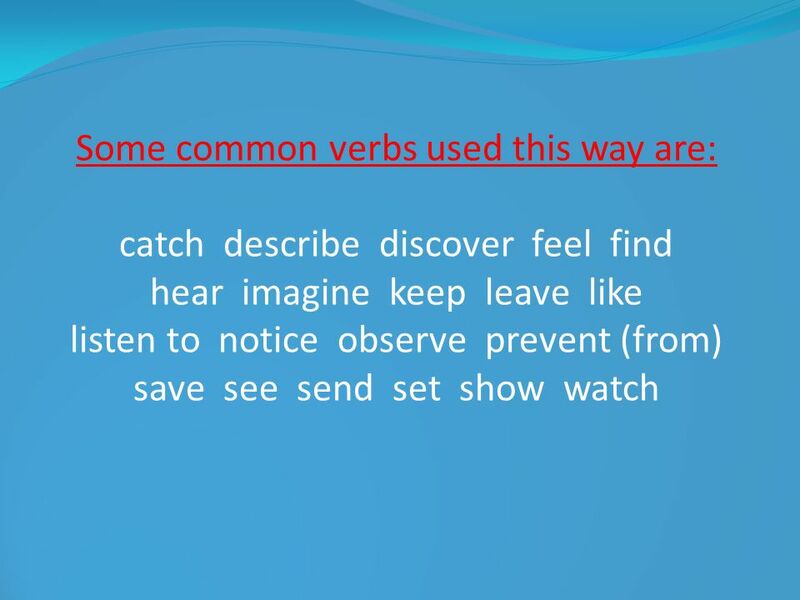 Complete these sentences using the correct form of the verb in brackets: 1. ……(GO) into business involves …. (TAKE) a certain amount of risk. 2. That production is not cost-effective enough …..(CONTINUE) with it: we risk ….. (GO) bankrupt unless we modify it. 3. 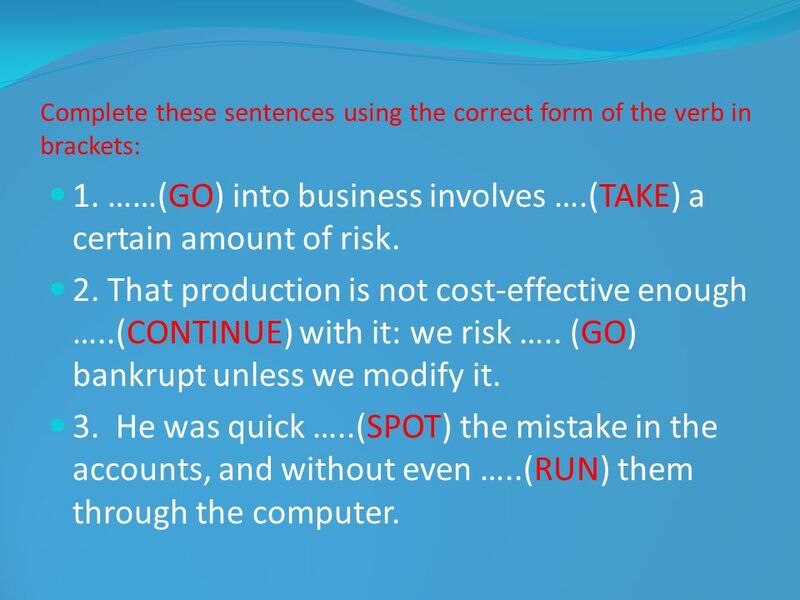 He was quick …..(SPOT) the mistake in the accounts, and without even …..(RUN) them through the computer. 14 …. 4. …. (DISCOURAGE) their workers from …. 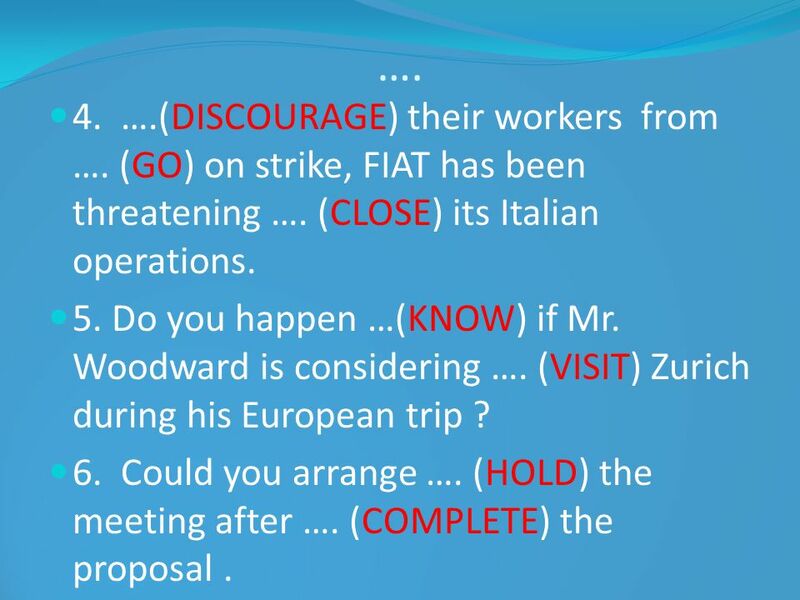 (GO) on strike, FIAT has been threatening …. (CLOSE) its Italian operations. 5. Do you happen …(KNOW) if Mr. Woodward is considering …. (VISIT) Zurich during his European trip ? 6. Could you arrange …. (HOLD) the meeting after …. (COMPLETE) the proposal . 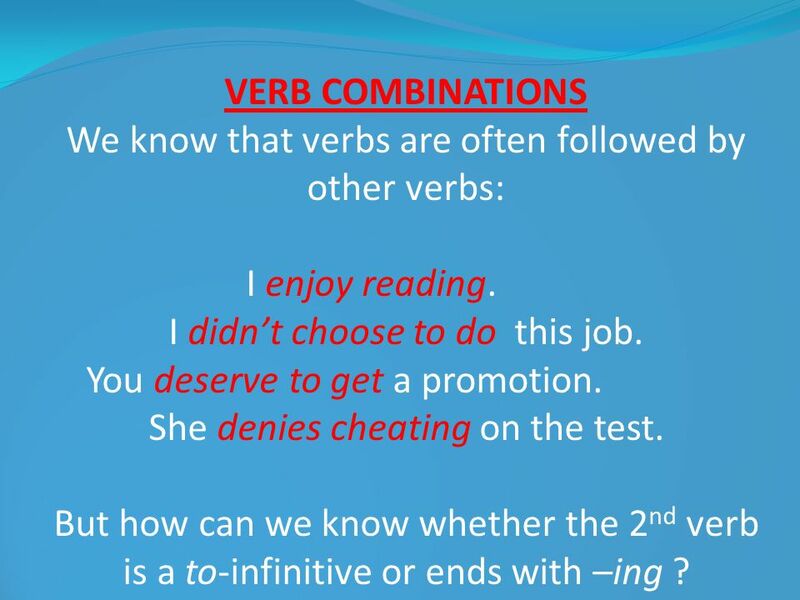 VERB COMBINATIONS We know that verbs are often followed by other verbs: I enjoy reading. I didn’t choose to do this job. You deserve to get a promotion. She denies cheating on the test. 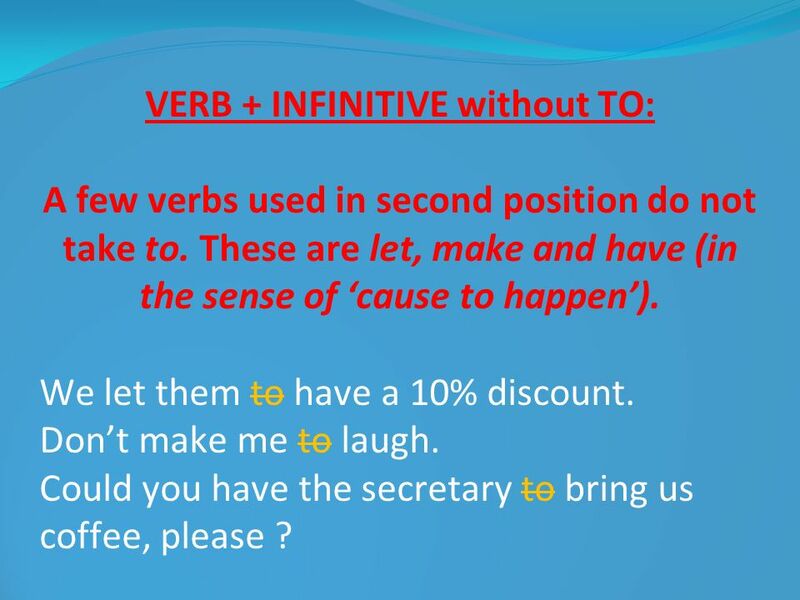 But how can we know whether the 2nd verb is a to-infinitive or ends with –ing ? 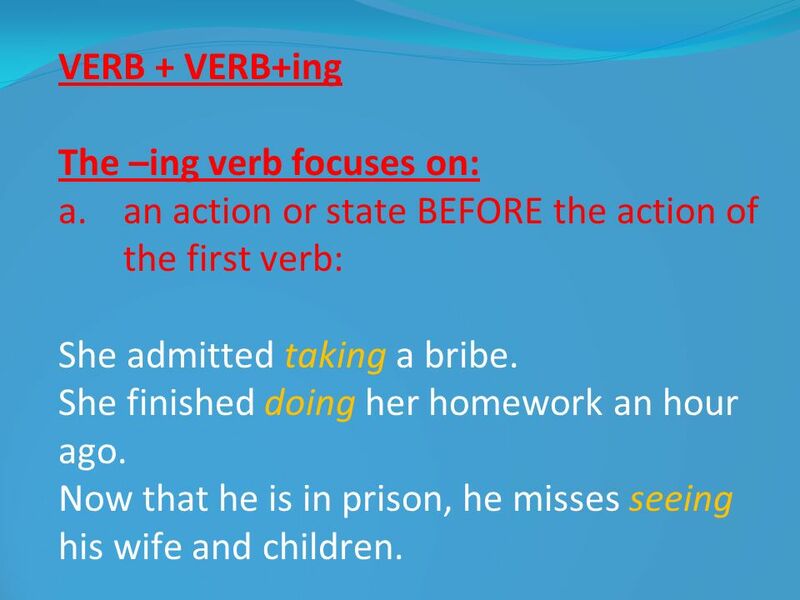 16 VERB + VERB+ing The –ing verb focuses on: an action or state BEFORE the action of the first verb: She admitted taking a bribe. She finished doing her homework an hour ago. 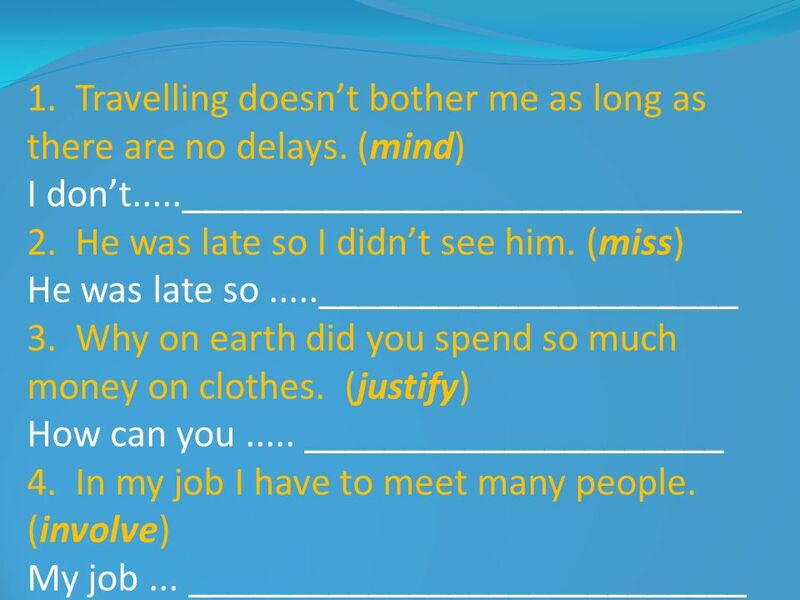 Now that he is in prison, he misses seeing his wife and children. 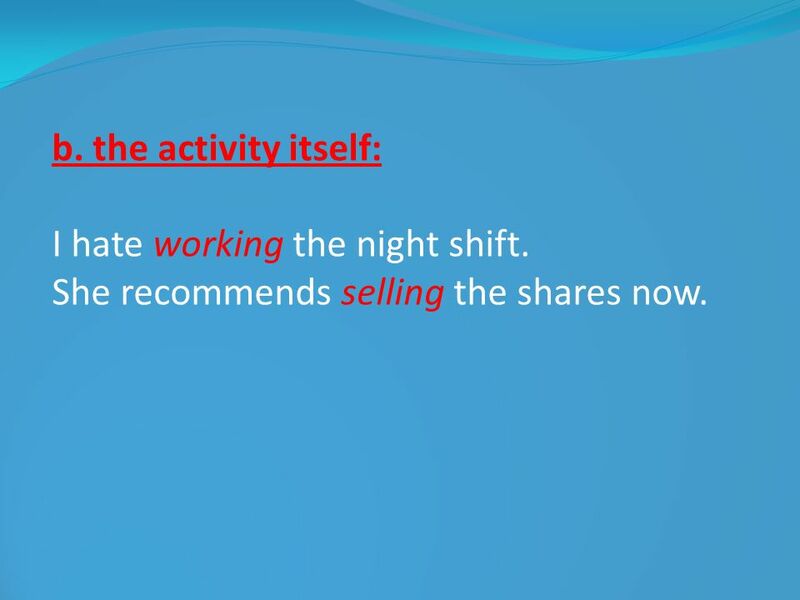 17 b. the activity itself: I hate working the night shift. She recommends selling the shares now. 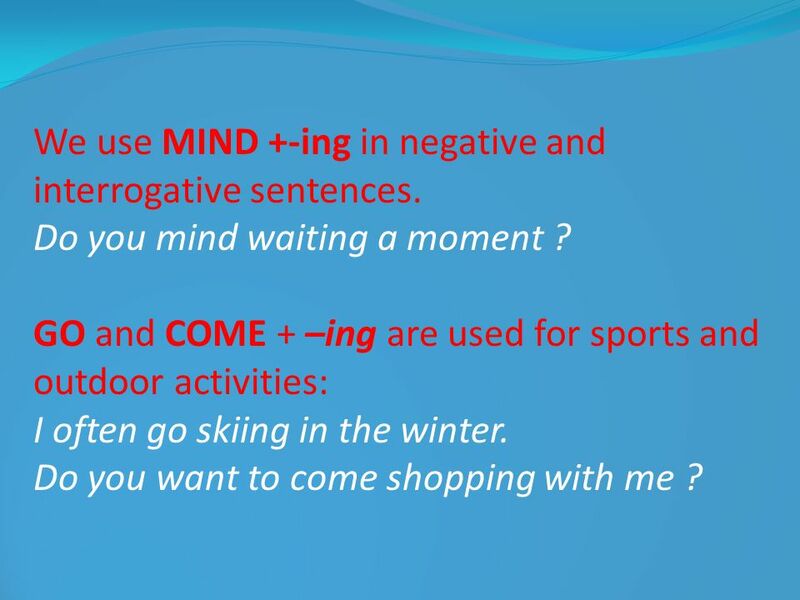 20 We use MIND +-ing in negative and interrogative sentences. Do you mind waiting a moment ? 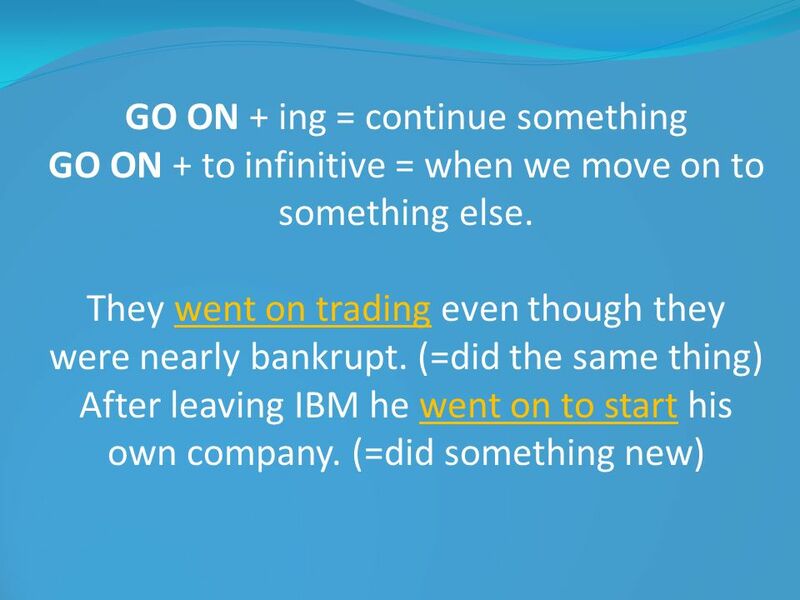 GO and COME + –ing are used for sports and outdoor activities: I often go skiing in the winter. Do you want to come shopping with me ? 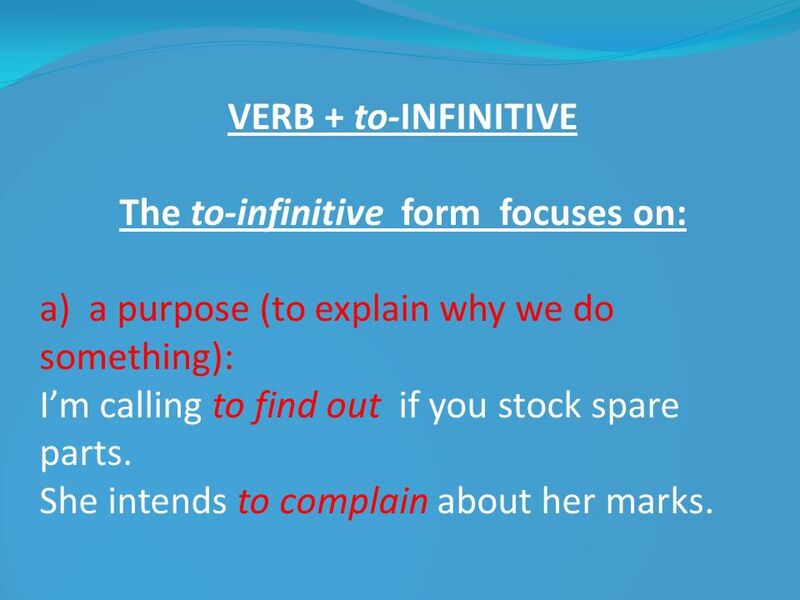 VERB + to-INFINITIVE The to-infinitive form focuses on: a) a purpose (to explain why we do something): I’m calling to find out if you stock spare parts. She intends to complain about her marks. 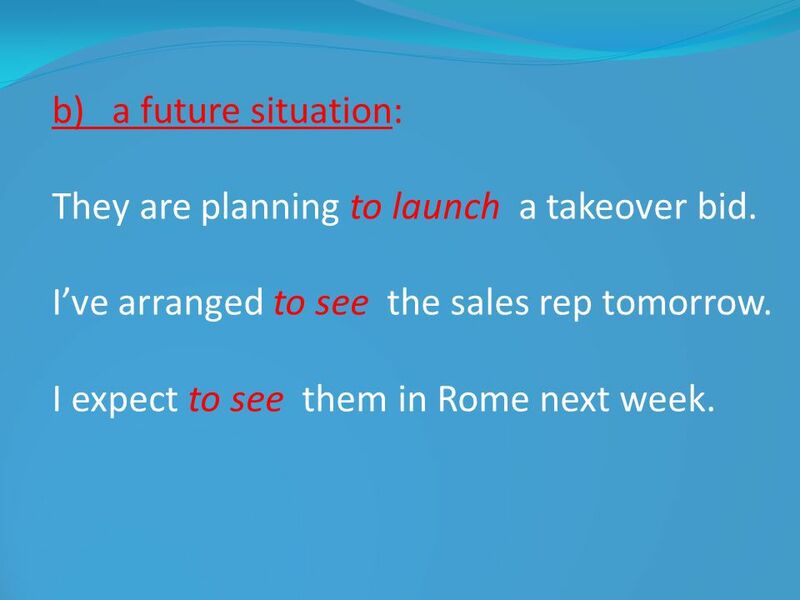 23 b) a future situation: They are planning to launch a takeover bid. I’ve arranged to see the sales rep tomorrow. I expect to see them in Rome next week. 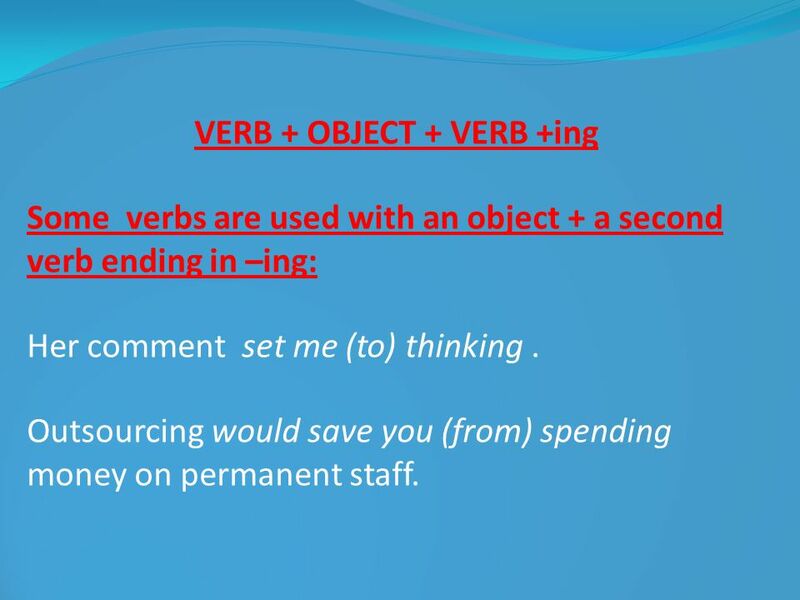 Some verbs are used with an object + a second verb ending in –ing: Her comment set me (to) thinking . Outsourcing would save you (from) spending money on permanent staff. 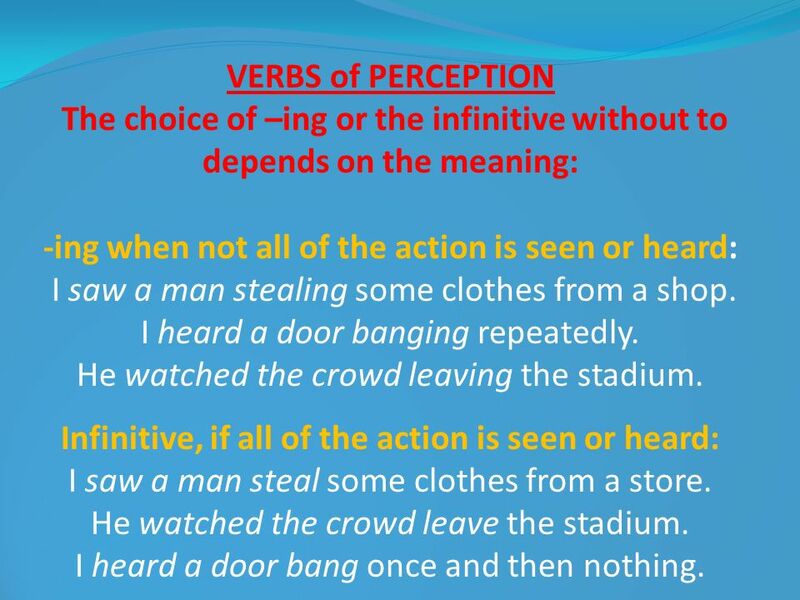 VERBS of PERCEPTION The choice of –ing or the infinitive without to depends on the meaning: -ing when not all of the action is seen or heard: I saw a man stealing some clothes from a shop. I heard a door banging repeatedly. He watched the crowd leaving the stadium. 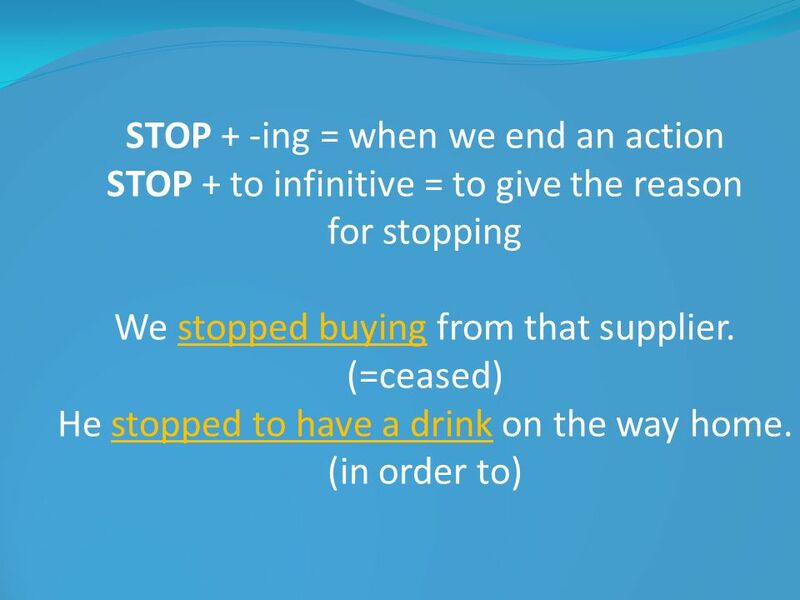 Infinitive, if all of the action is seen or heard: I saw a man steal some clothes from a store. He watched the crowd leave the stadium. I heard a door bang once and then nothing. 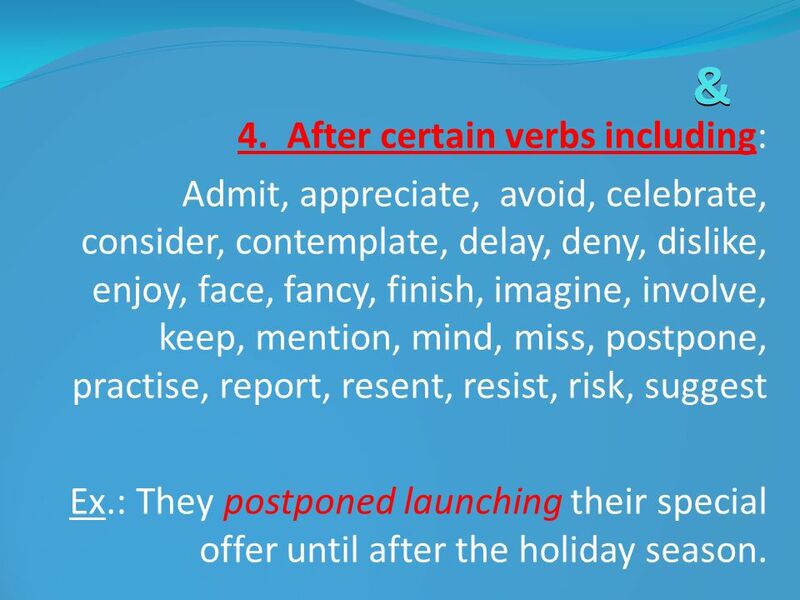 A few verbs used in second position do not take to. These are let, make and have (in the sense of ‘cause to happen’). We let them to have a 10% discount. Don’t make me to laugh. Could you have the secretary to bring us coffee, please ? 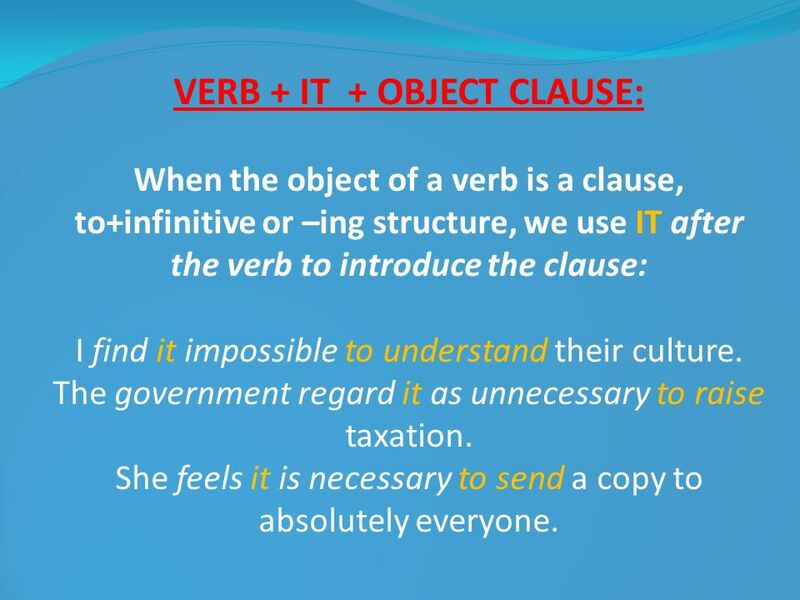 When the object of a verb is a clause, to+infinitive or –ing structure, we use IT after the verb to introduce the clause: I find it impossible to understand their culture. The government regard it as unnecessary to raise taxation. She feels it is necessary to send a copy to absolutely everyone. I find impossible to work with him. They made us to work extremely hard in my previous job. 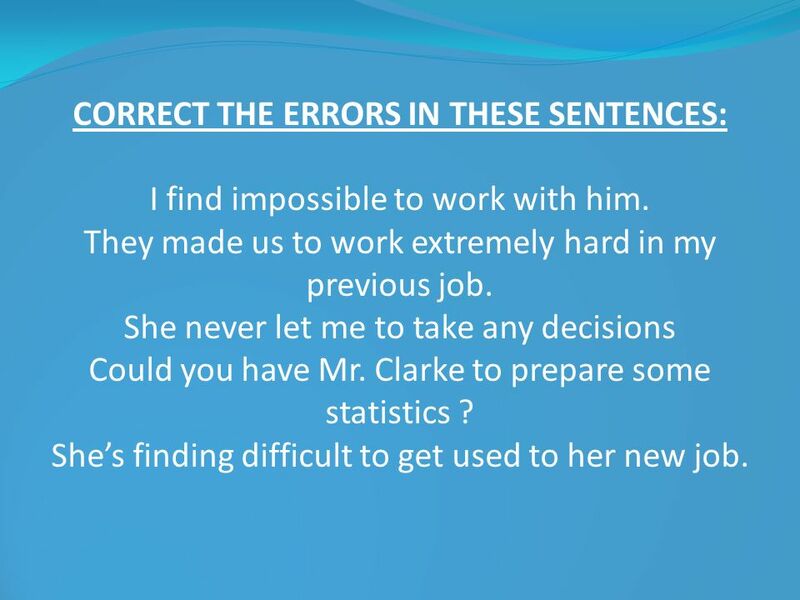 She never let me to take any decisions Could you have Mr. Clarke to prepare some statistics ? She’s finding difficult to get used to her new job. 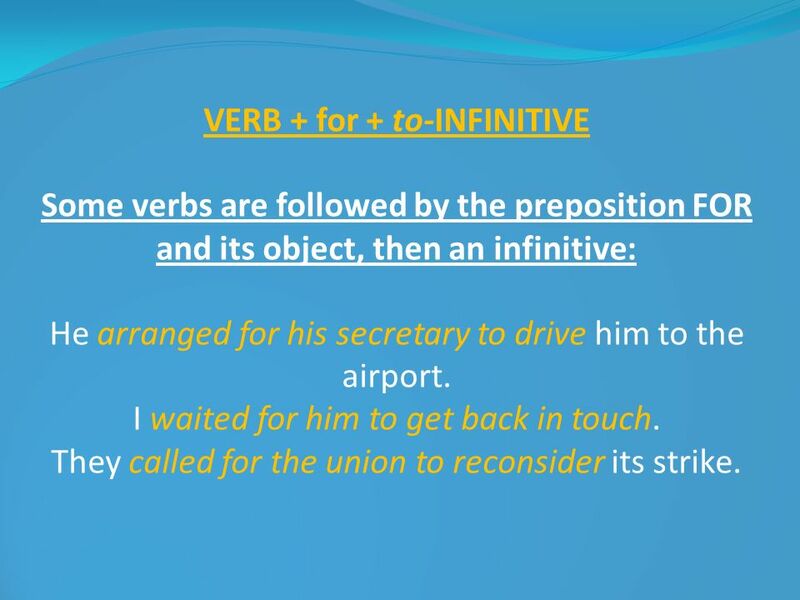 Some verbs are followed by the preposition FOR and its object, then an infinitive: He arranged for his secretary to drive him to the airport. I waited for him to get back in touch. They called for the union to reconsider its strike. 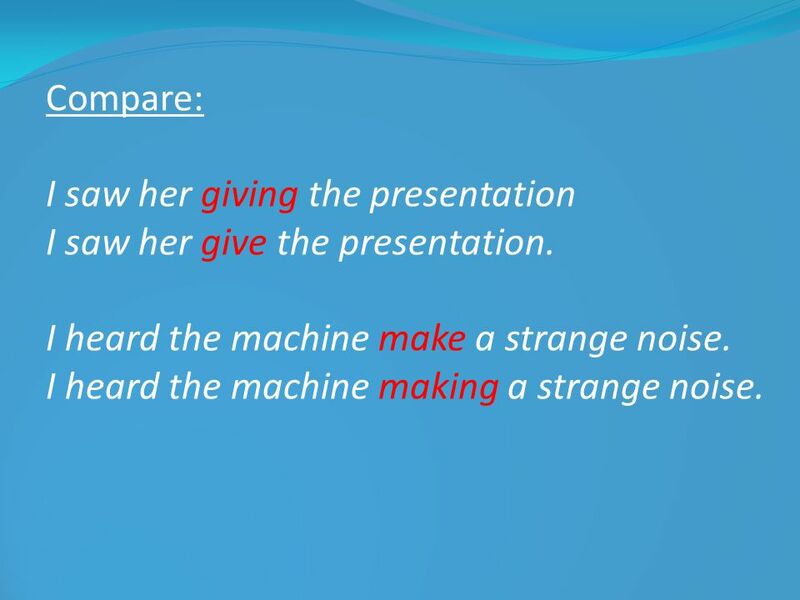 It’s possible to introduce a possessive pronoun or genitive between the first and second verb. 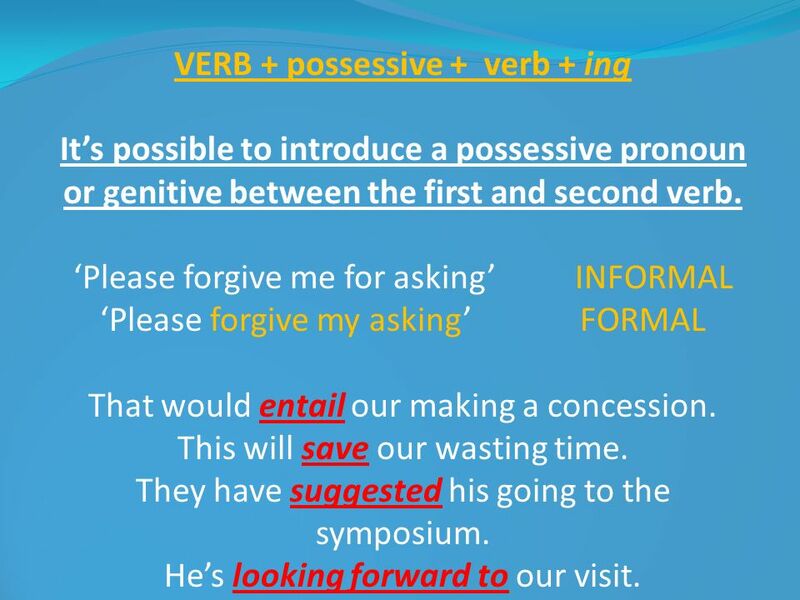 ‘Please forgive me for asking’ INFORMAL ‘Please forgive my asking’	FORMAL That would entail our making a concession. This will save our wasting time. They have suggested his going to the symposium. He’s looking forward to our visit. 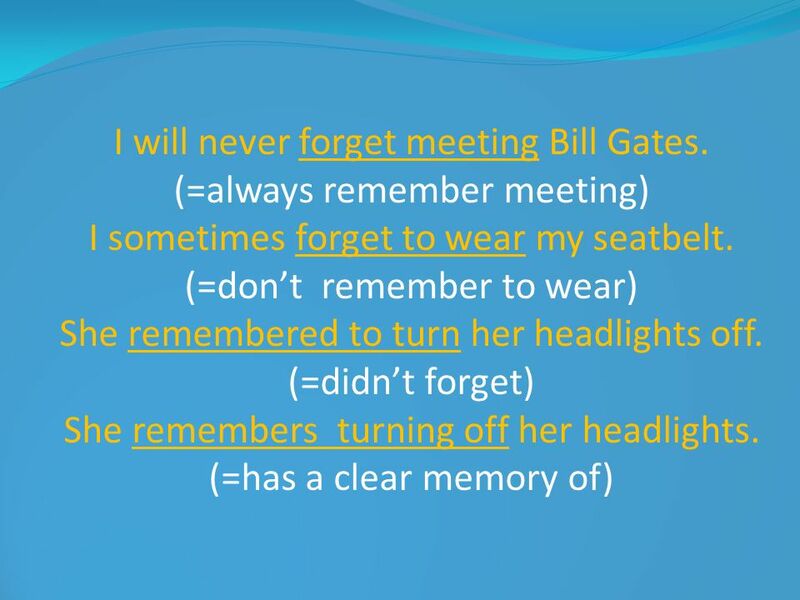 Certain verbs can be followed either by an infinitive or another verb +ing, but the choice leads to a change in meaning: REMEMBER / FORGET: + ing for PAST MEMORIES (the action happens before remembering) + to infinitive for actions someone is/was supposed to do. 45 Compare: I saw her giving the presentation I saw her give the presentation. I heard the machine make a strange noise. I heard the machine making a strange noise. 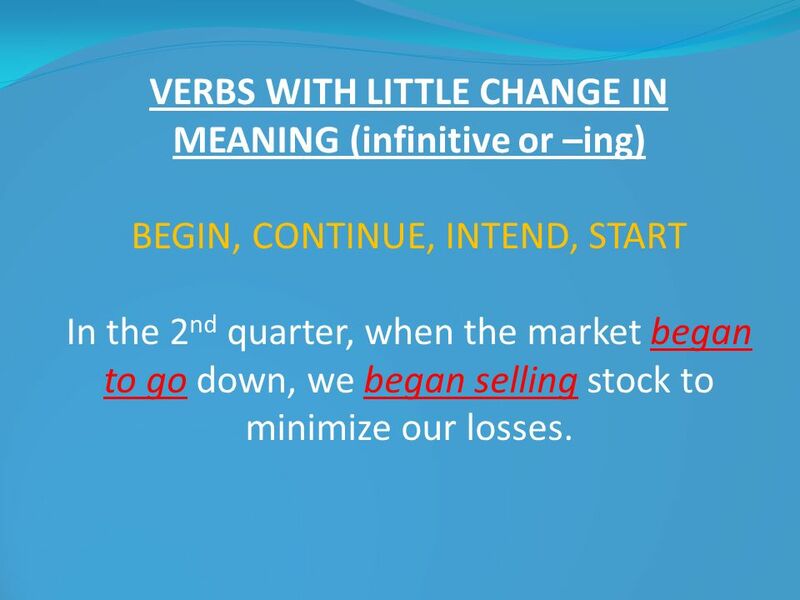 BEGIN, CONTINUE, INTEND, START In the 2nd quarter, when the market began to go down, we began selling stock to minimize our losses. 47 N.B. 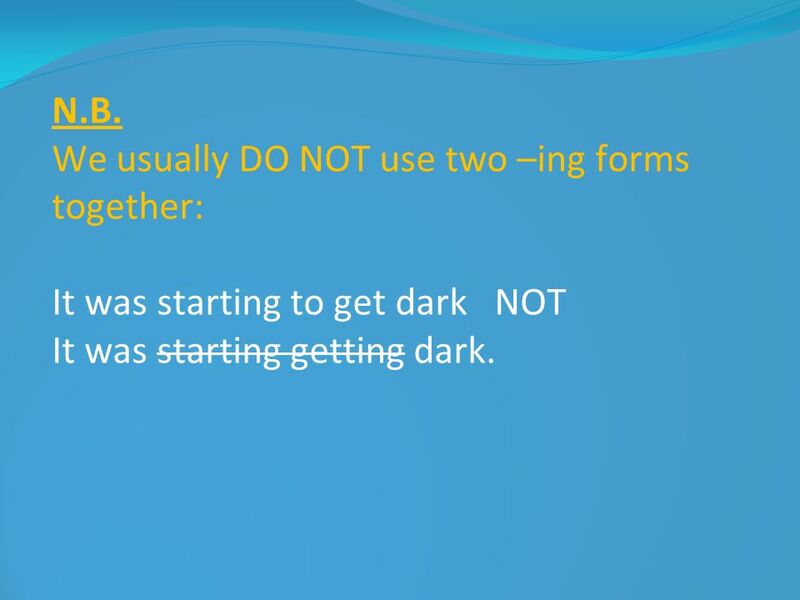 We usually DO NOT use two –ing forms together: It was starting to get dark NOT It was starting getting dark. 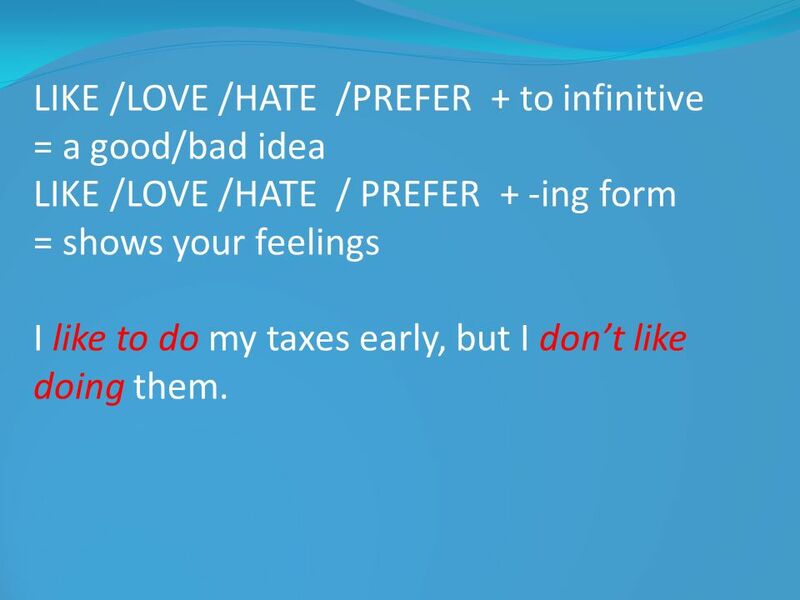 = a good/bad idea LIKE /LOVE /HATE / PREFER + -ing form = shows your feelings I like to do my taxes early, but I don’t like doing them. 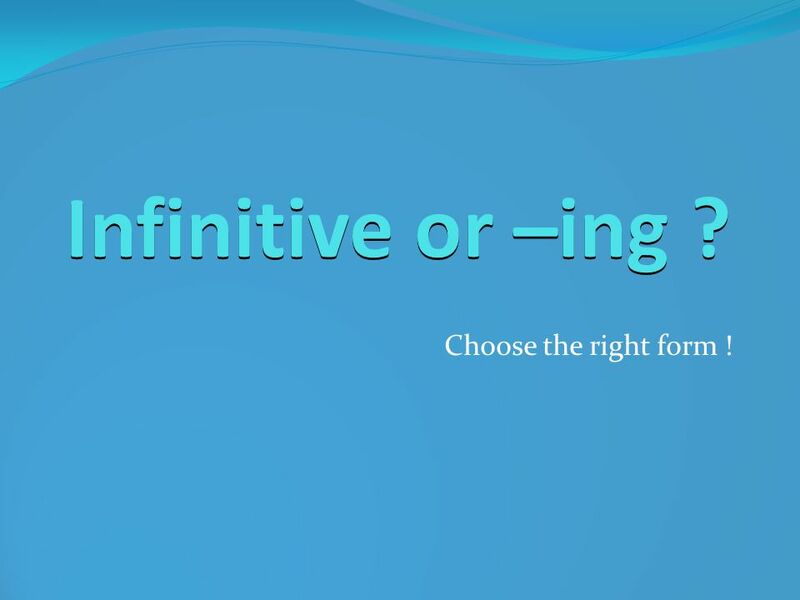 Download ppt "Infinitive or –ing ? 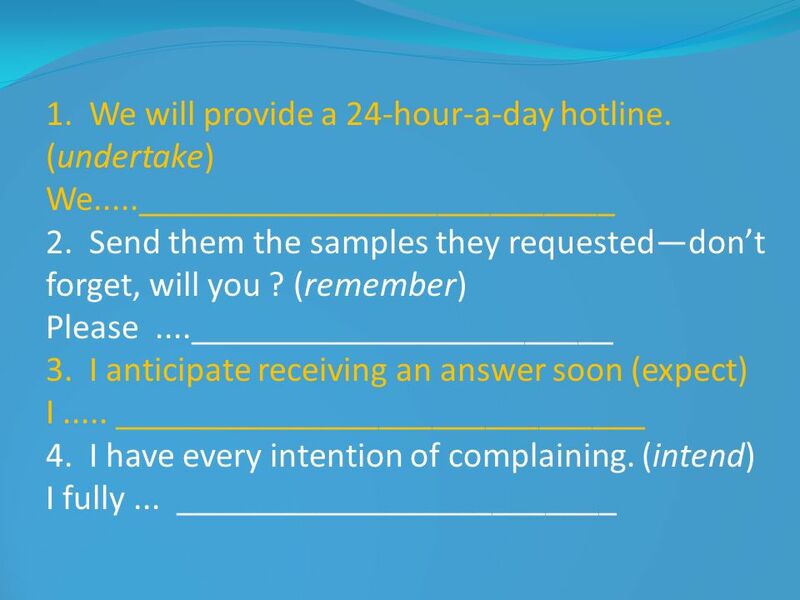 Choose the right form !." 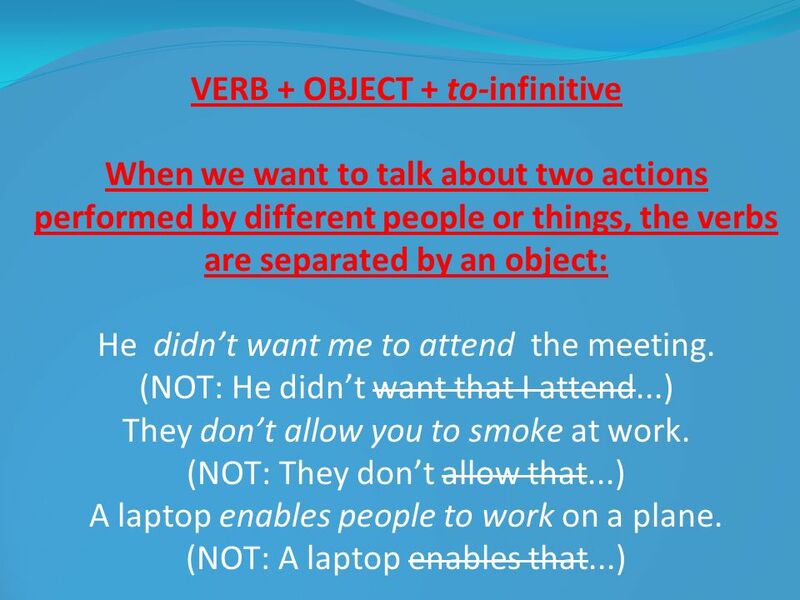 INFINITIVE VS. GERUND VERB PATTERNS 1. 020. 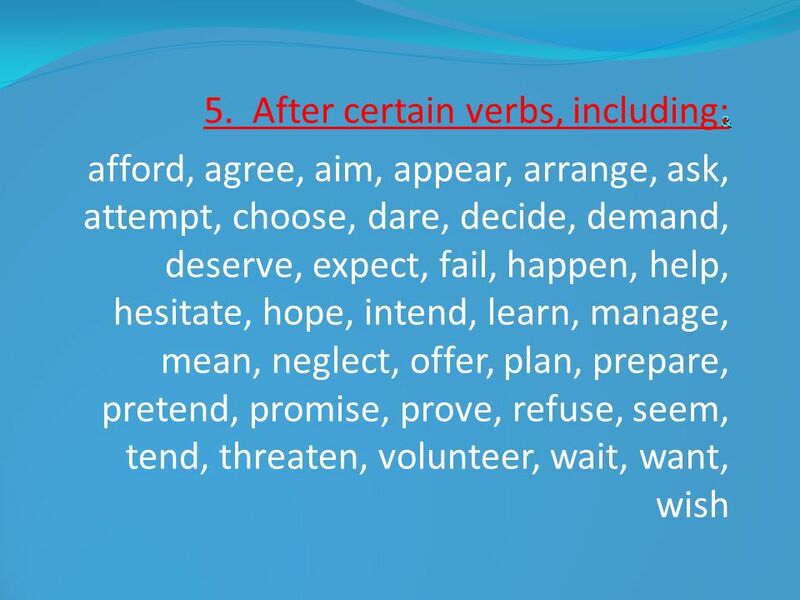 Verb Lists: Infinitives and Gerunds Verbs Followed by an Infinitive She agreed to speak before the game. 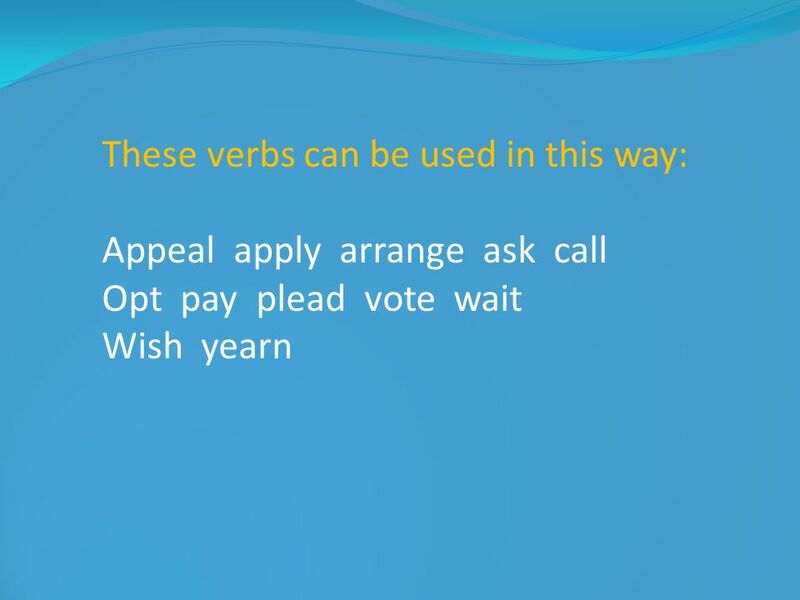 agree aim appear arrange ask attempt be. 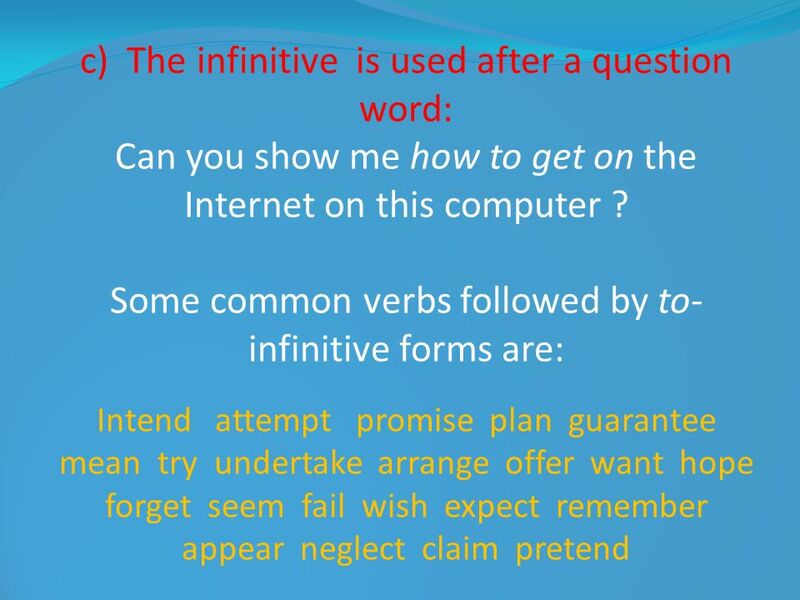 INFINITIVES 1. AS A SUBJECT: To lend money is a risky business. OR It is a risky business to lend money. 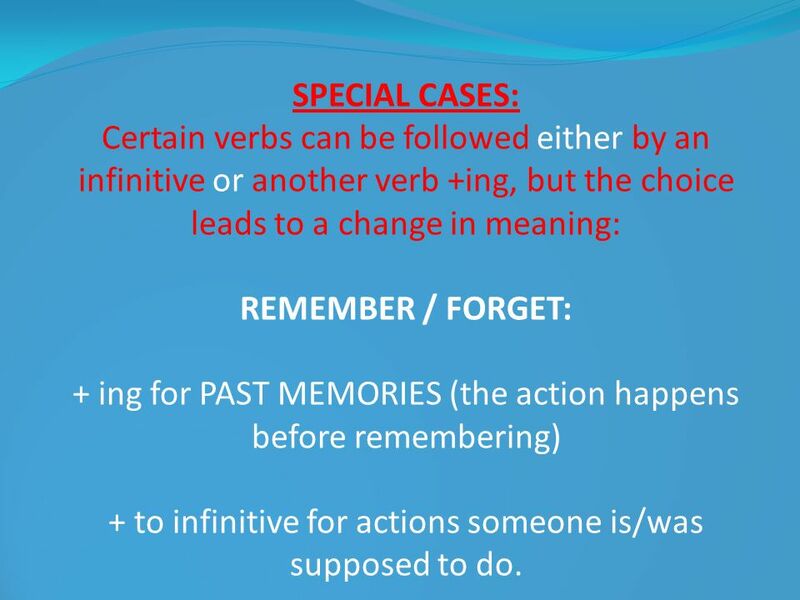 GERUND or INFINITIVE 2nd of BACHILLERATO. The true story. I like diving. I want to go to England. She hopes to pass this exam. My brother started crying. 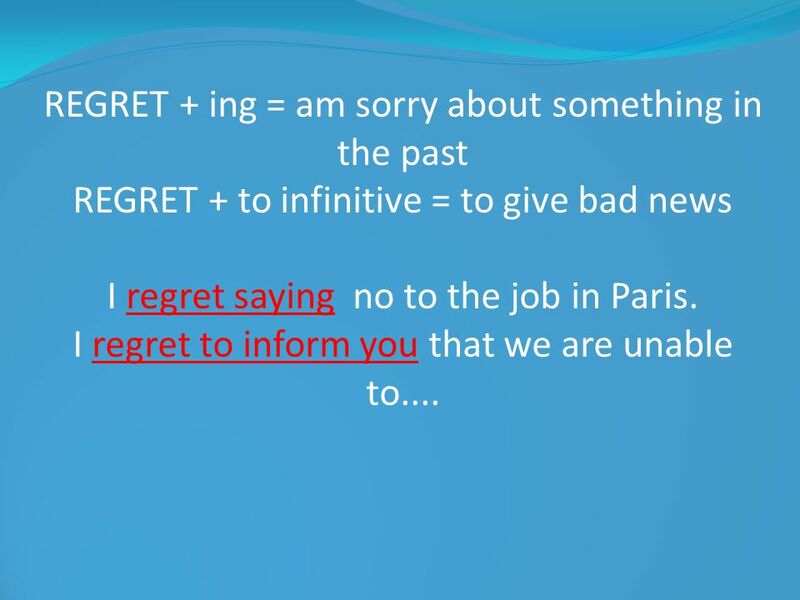 Infinitive With to After some adjectives: Afraid, glad, sorry, happy, amazed, hard…. F.ex. Mary was happy to hear her friend was out of danger. After. 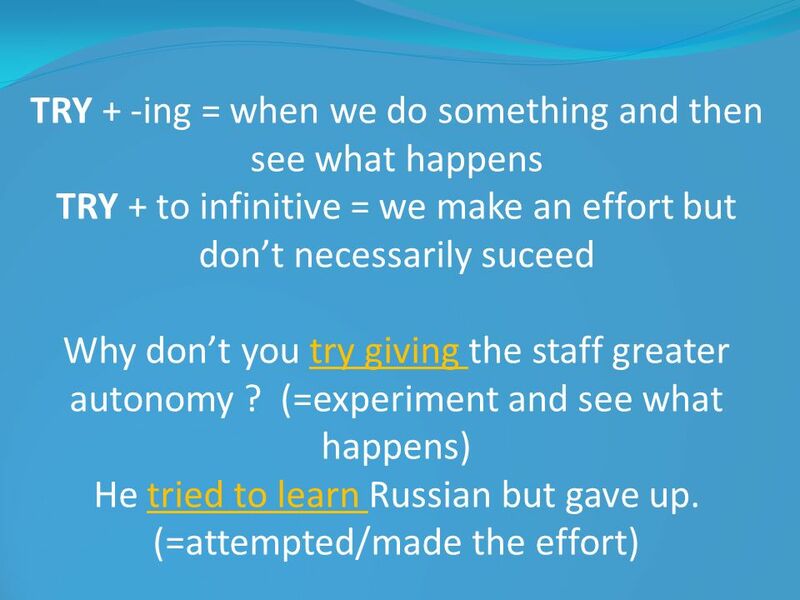 Gerunds and Infinitives. 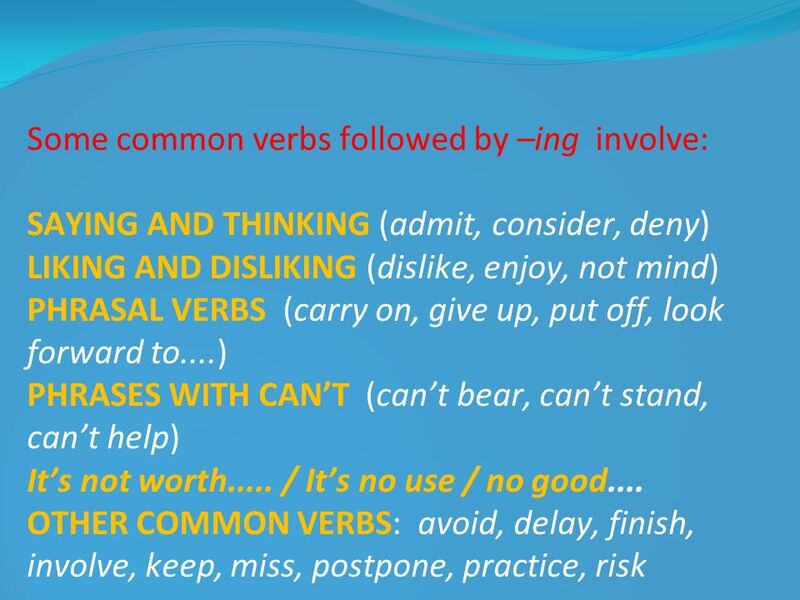  Gerunds and infinitives are verb forms that can take the place of a noun in a sentence. 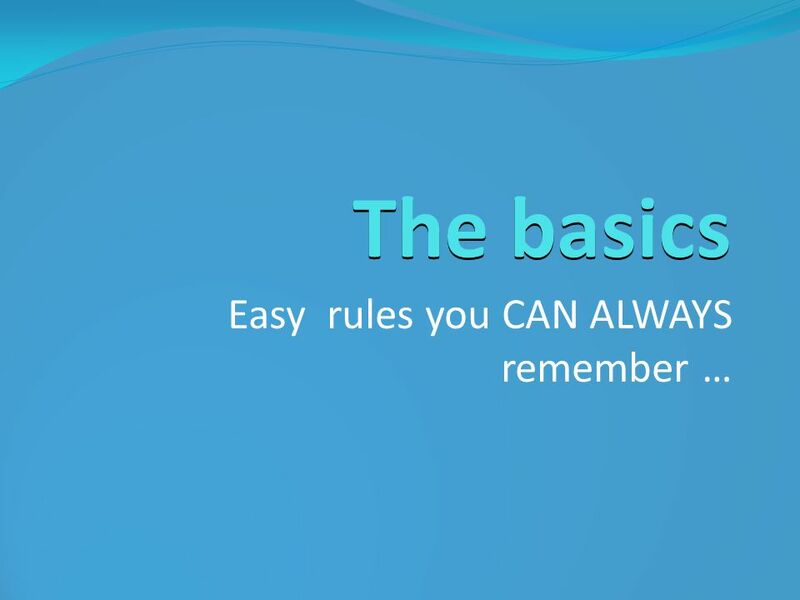  The following guidelines and lists.